Fence Permits: Fence permits can be obtained at the Village office for a $25.00 permit fee, prior to putting up a fence. You must call Julie before you dig! Building Permits: Obtained through Sangamon County Building Safety Department, 2833 South Grand Ave East, phone 217-535-3145 ext 3724. Held 1st & 3rd Tuesday at 5:30 pm each month unless posted differently for Election Days and Holidays. Held at the Administration Office. We have Municipal Building Rental—Capacity 200 people with 23 tables & 170 chairs. Resident rental: Sunday—Thursday $200 per day, Friday—Saturday $325. Non-resident rental fees: Sunday—Thursday $250 and Friday—Saturday $400.00 All rentals must also pay $200 deposit that is refundable as long as there are no damages and the muni building is clean. Liquor liability insurance is required if alcohol is being sold. The deposit and the liquor liability insurance must be in the name of the lessee. 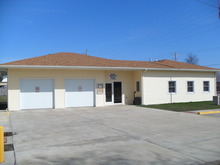 Call 528-7624 to rent the building. Address is 1620 N. Milton. A deposit is required for all new water services. Water bills are mailed the first working day of the month and must be paid by the last day of the month to avoid a penalty. Penalties are automatically assessed by the computer. If payment has not been received prior to the first working day of the new month, you will be assessed a 10% late fee and you will only have 15 days to pay the previous bill and the new bill in order to obtain water services. NSF fees and reconnect fees may also apply.